This card is great, simply because it makes Mech decks come out of the aggro-persona that they've had since GvG and creates way for some sort of mid-range Mech decks. Would love to see more mechs of this sort in the future. Solid 5/5 body with a somehow underwhelming battlecry, and with Mechwarper it only cost 4 mana, also a lot safer than Fel Reaver. Finally Mech-deck has a decent mid-range minion 5/5 is a solid stats. It is on-curve too, considering you dropped Mechanical Yeti on T4. This could be swapped with Healbot (some decks run them, in case they are getting burst down by Stalling Deck (Oil Rogue, Freeze Mage, Malylock). Yes, now I understand better, but I disagree a bit in parts, I'm having great results with this guy in a very aggressive mech deck, sometimes it goes down in turn 3,4 buffing a Mechwarper or any other mech and that's strong. If a Mimiron's Head deck ever works it's got these in it. Coin this out on your turn 3 with mechwarper, then play Head on 4. 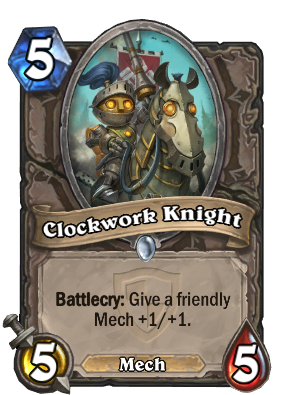 Seems just a little weak compared to Screwjank Clunker and Upgraded Repair Bot, though of course neither of those cards are neutral. Solid Arena pick, probably not going to see play in Constructed. Almost guarantee this won't see play in constructed. Loatheb has already taken up the 5 slot, and this really doesn't do anything to justify the cost. Might be reasonable in a Mech Shaman or Mage deck, but even then it probs would be subpar because the only value you could get it by getting, and keeping out Mech Warper. Emperor Thaurissan is 6 mana, not 5. Oh yeah; that was a typo. Its a nice but boring card. Stat to Cost wise, its fine. 5m for a 5/5 isn't a bad deal. The fact it has mech has a tag-line means people can go more full on gimmick with mechs. The battlecry is nice, practically a Shattered Sun Cleric, for a common and if it was anything stronger it would have been more akin to a rare.